Dan Kovalik should be embarrassed by his May 25, 2018, op-ed in the Pittsburgh Post-Gazette in which he lauds Venezuelan President Nicolás Maduro’s repressive authoritarian regime. The piece is political propaganda filled with Trump-level disregard for facts or the truth. To those familiar with Mr. Kovalik’s work, these arguments are unsurprising. He is not an objective voice, but instead a longtime supporter of Venezuela’s Bolivarian Revolution and a member of the political fringe (his 2017 book is titled The Plot to Scapegoat Russia: How the CIA and the Deep State Have Conspired to Vilify Putin). There are many factual inaccuracies with the piece—Mr. Kovalik says, for example, that the music education program, known as “El Sistema” (The System) was founded by Hugo Chávez, whereas any Venezuelan knows it was created in 1975 by Maestro José Antonio Abreu—but there are at least two major, damaging and fanciful claims in his article: 1) that Venezuela is a democracy with free and fair elections, and 2) that the U.S. and its economic sanctions are to blame for Venezuela’s hardships. Venezuela is not a democracy, and late president Hugo Chávez and now Maduro are responsible for the country’s unprecedented crisis. For many years under Chávez, Venezuela was a hybrid regime—a combination of democracy and dictatorship that usually combines elections with limited political freedoms for citizens. However, the country has become more authoritarian since 2016, as Maduro has repeatedly thwarted Venezuelan citizens’ attempts to change the country’s direction through democratic means. Beginning in early 2016, the government-controlled Supreme Court annulled every single law approved by the majority opposition in the National Assembly, before progressively stripping the legislature of its functions. On multiple occasions, the National Guard, the police, and other government supporters even assaulted opposition legislators. In 2017, Maduro proposed a constituent assembly, ostensibly to rewrite Chávez’s 1999 constitution but in reality to seize legislative powers from the one branch of government he did not control—which it did in August of that year. Nor are the elections themselves free or fair. The Maduro government relies on intimidation, threats, harassment, and coercion to earn votes, and in September 2017 the government introduced a new identity document called the Carnet de la Patria, which promised cardholders benefits like food and medicine in exchange for loyalty to the regime—including during elections. The president also gradually barred all major opposition candidates from running for office. 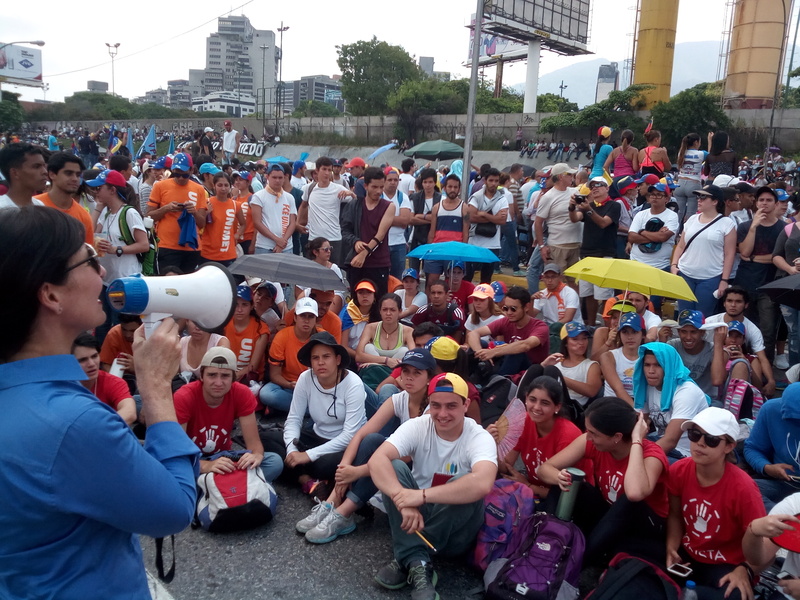 Consequently, Maduro’s opponent on May 20 was Henri Falcón, a Socialist ex-Chavista governor and mayor turned government critic who is largely dismissed by much of the country’s polarized electorate (and who Mr. Kovalik laughably characterizes as coming from “the business community”). Not even the elections themselves are free of deceit. In the July 2017 contest for the (unconstitutional) Constituent Assembly, the Venezuelan government claimed a fantastical participation of 8.5 million people, a number that independent analysts and Smartmatic, the company in charge of the electronic voting machines, say was inflated by at least one million votes and probably more, as only 3.7 million people had voted 90 minutes before polls closed. This was not a one-time occurrence; electoral forensics also showed fraud in the October 2017 gubernatorial elections. The role of the U.S. and its economic sanctions is even easier to dismantle: the country has been in an economic free-fall for nearly five years now, and non-targeted economic sanctions are barely a year old. How could they possibly be the cause of the decrepit state of hospitals, the malnutrition and starvation, and the resulting refugee crisis? The expansive price controls and currency controls that helped lead to a black market for foreign currency and hyperinflation are Chávez’s doing. Mr. Kovalik professes to support Venezuela’s Bolivarian Revolution for helping the poor. But 82% of the country is now below the poverty line, which indicates it’s more important for him to blindly follow an ideology than update his priors and criticize a “revolutionary” government. The problems are tragic and real. My middle-class Venezuelan wife has 24 first cousins; 13 of them have emigrated and 5 others have plans to leave this year. One of them is my brother-in-law, who quit his job as an oil industry contractor in eastern Venezuela earlier this year when, due to hyperinflation, his salary was not sufficient to cover the bus ride from his home to work. And without enough money to purchase scarce food, my in-laws drive once a month to neighboring Colombia to buy basic goods with my wife’s credit card that they cannot afford in Venezuela. The imperialist media, or the U.S. government, or angry capitalists are not to blame. Venezuela is a dictatorship whose economic problems are the result of irresponsible policymaking. The more Mr. Kovalik and others see conspiracies where there are none, the more they allow themselves to become apologists for a dictator. John Polga-Hecimovich is an Assistant Professor of Political Science at the U.S. Naval Academy. He has published peer-reviewed work on democracy and presidentialism in Latin America. He has lived and travelled in Venezuela, and his wife is Venezuelan. The views expressed here are solely his and do not represent the views of or endorsement by the United States Naval Academy, the Department of the Navy, the Department of Defense, or the United States government. John Polga-Hecimovich is an Assistant Professor of Political Science at the U.S. Naval Academy. He has published peer-reviewed work on democracy and presidentialism in Latin America. He has lived and traveled in Venezuela, and his wife is Venezuelan. He has published articles in the Journal of Politics, Political Research Quarterly, Party Politics, Latin American Politics and Society, the Journal of Politics in Latin America, and Revista de Ciencia Política.